We are delighted that you are interested in participating in the 74th Fergus Scottish Festival and Highland Games. We have been able to successfully implement online applications and payment this year. Once an applicant receives confirmation by the Concessions Committee, it is up to the Concessionaire to ensure that all required information is completed. Specific Vendor rules and regulations will be communicated once applicant receives confirmation. Payment must be made online on or before June 1, 2019. A link to the payment will be provided in the acceptance letter. If payment is not received on or before June 1, 2019 along with required documentation, the Concessions Committee reserves the right to revoke your application and offer that site to another concessionaire. Lot assignment is at the discretion of the Concessions Committee; if you have a request for a specific location, please make a note on the document submission form. While every effort will be made to accommodate requests, we cannot guarantee that yours will be met. We face new safety and municipal regulations to which we must comply. Entrance onto the Festival grounds prior to Thursday August 8, 2019 WILL NOT be permitted. All Vendors must be set up by 12:00 noon on Friday, August 9, 2019, and be prepared for safety inspections. While we understand special circumstances do arise, please contact us if you have any concerns, questions or comments. We will do our best to accommodate and help navigate a solution that will work best for you and the Festival. 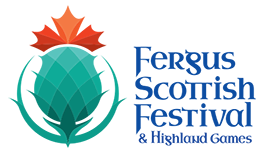 Should you have any questions, do not hesitate to contact the office or email us directly: concessions@fergusscottishfestival.com. Are pets allowed in the Concessions area? No pets (animals, reptiles, or birds) are allowed in the Concessions area. They must be confined to a designated campsite. Pets are not allowed on the Festival site, excluding Service Animals. For more information, please see the Festival’s Pets Policy. Is there a specific area at the Festival for Vendor camping? Fully serviced campsites on the Festival grounds are available for the weekend, at a cost. The Festival also has a limited amount of fully-serviced campsites available, located immediately behind the Concession lots for the weekend. Water is available, where applicable, at costs indicated on the Vendor application form. Hydro is available at 115v /60hz. @ 15amps or 230v /60hz. @ 30amps. Any special hook-up will be at your own expense and must be arranged with our on-site Hydro Technicians. All electrical equipment to be connected must have the Electrical Safety Sticker. If the sticker is not visible, the equipment WILL NOT be hooked up. Garbage disposal and garbage receptacles will be available. The garbage drums located on the Concessions roadway are NOT for your use. Please break down all boxes for recycling. *If you leave any garbage on your site or in the public drums, you will be fined $500. Where can I dispose of my grey water? Can I bring/run a generator? No power generators of any kind will be permitted due to noise. This affects the competition judges’ ability to hear events. Can I use a loudspeaker to promote my business? No loudspeakers or objectionable noise will be tolerated in the Concessions area. No refunds will be granted. While we understand special circumstances do arise, please contact us with any of your concerns. We will do our best to accommodate and help navigate a solution that will work best for you and the Festival. Are there set hours of operation during the Festival for Vendors to operate? While the Festival has no set hours required for Vendors to operate, we do strongly encourage you operating your Concession for the majority of the Festival, including Saturday evening. Please note: it is expected that you will remain until the Festival ends on Sunday afternoon.